A lava flow is an outpouring of molten basalt rock which comes from a non-explosive eruption. The flow travels downhill from the eruption source. As the flow moves over new ground, it typically expands by sending out lobes or "toes," in the case of highly fluid lavas. Being in contact with the air, lava lobes and toes have a chilled surface, and they grow as lava inside the flow inflates them. They may join other lobes and become absorbed in the main flow, or they can stall and grow cold if the flow begins to move in another direction. The edge of a lava flow typically shows lobes where the lava has stopped moving and cooled. On Earth, highly fluid lava flows begin as smooth and unbroken, and have a shiny, almost glassy surface. Fluid lavas are called pahoehoe (PAH-hoy-hoy), a Hawaiian word meaning "smooth lava." Pahoehoe flows can run for many kilometers (miles). They usually erupt at temperatures of 1,100° to 1,200° C.
Another kind of lava has a rough, blocky texture. It's called a'a (AH-AH), meaning "rough lava" in Hawaiian. A'a flows tend to be thicker than pahoehoe flows, and they have slightly lower temperatures, 1,000 to 1,100° C.
So far, scientists see evidence on Mars only for flows that were probably pahoehoe-like while erupting. But like so much of Mars, we are only beginning to learn the details. Lava tubes form on terrestrial pahoehoe lava flows. They also occur on the Moon, Mars, and probably Venus and Mercury as well. You can think of a lava tube as a pipeline within a lava flow that keeps it fed. As a lava flow spreads out from its source at a volcanic vent, the surface cools and hardens while the flow remains hot inside. Lava tubes are winding channels inside the flow where lava runs hottest and most fluid. When the flow finally stops advancing, the lava may freeze and fill the tube wholly or partly. The lava may also drain away, leaving the tube empty. 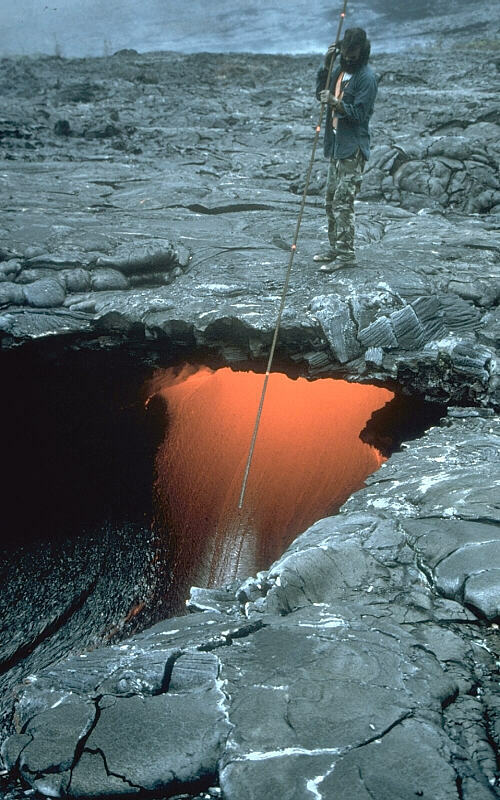 If a lava tube runs close to the surface, when the tube empties, the roof may collapse, either completely or only in places. When there is a line of pit craters, there's a good chance the line traces the course of an underground lava tube. Sometimes only a small part of a lava tube's roof will fall in. This leaves just a small hole in the surface looking like a cave entrance or "skylight." One MSIP class of 7th graders discovered a previously unknown skylight on the giant shield volcano Pavonis Mons . Many channels on Mars were carved by water, but not all. 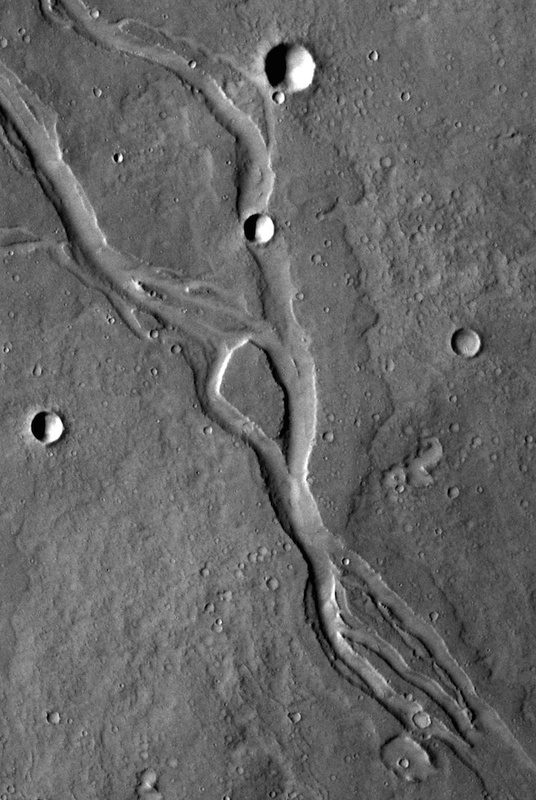 Molten rock can also flow and create features that resemble stream channels. 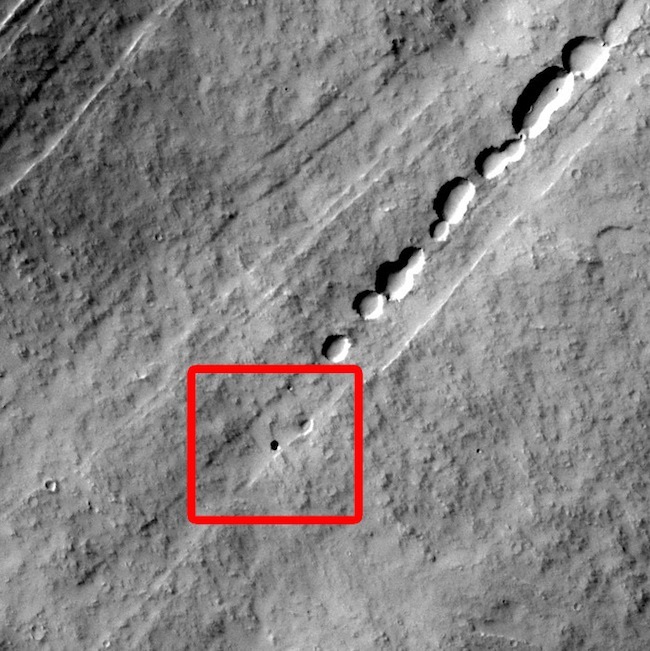 But because lava works in different ways, it's important for scientists to identify lava channels so as to understand the history of a region on Mars. Many Mars lavas are highly fluid and flow easily, like motor oil or maple syrup. If a flow emerges from a volcanic vent, it may spread as a wide sheet covering a large area until it cools and hardens. If the eruption continues, however, younger lava may erode a channel across the cooler, harder lava sheet. Erosion by lava operates much like erosion by water. The lava flow will pick up and carry away any loose or poorly bonded pieces of earlier flows. There's one big difference, however. Hot lava can melt a channel across a colder flow, and this channel will probably meander just like a stream of water. One way to tell a lava channel from a stream channel is that a stream channel will show small rocks, sand, and other debris on its bed. But be careful! A lava channel can also collect wind-blown sand and thus resemble a stream channel. And of course, water can flow down a lava channel that has cooled and leave stream deposits behind. So telling one type from the other isn't always simple. It usually means looking closely at the physical evidence and making a probable decision. Just to keep scientists on their toes, the region called Cerberus Fossae contains a long crack in the ground. From this came both lava and water! Lava rose toward the surface through cracks in the crust. As it rose, it melted ground ice, which burst out through the cracks. The floods of water eroded channels. When the lava reached the surface, it too poured out. It mostly followed the water-carved valleys and channels, but it also spilled over untouched terrain, covering it with lava.The result is a geological puzzle box to sort out and describe.